Happy FRIDAY! 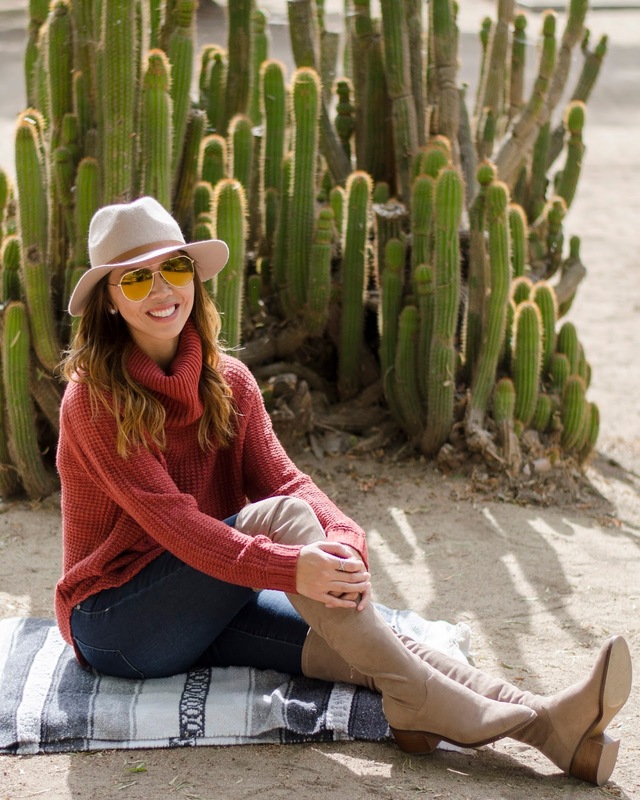 Now that the weather has finally cool down in San Diego, I'm so excited to be wearing cozy sweaters, my favorite over the knee boots and the comfiest jeans. This is one of my favorite fall looks because it's so comfy, chic, and gives me all the fall vibes. 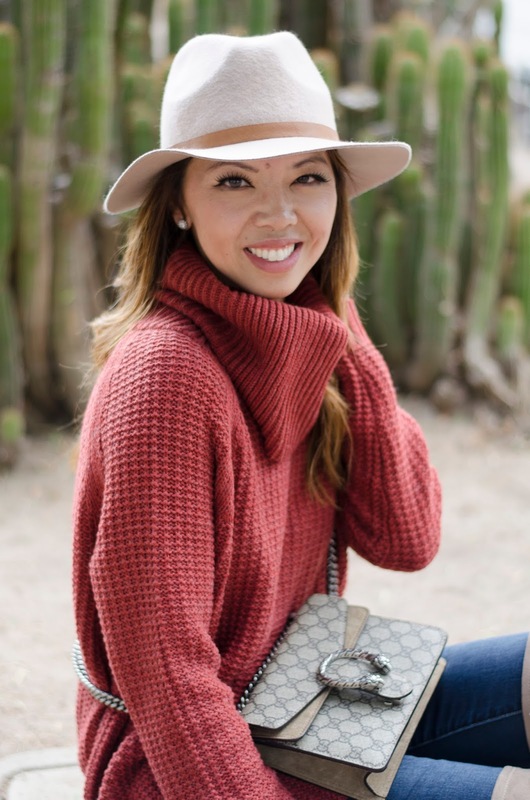 I've been a fan of cowl neck sweaters because they are so flattering and easy to throw on. The one I'm wearing is from Target and it's under $30 and comes in so many colors. I think this rust color is perfect for fall. The color reminds me of the gorgeous leaves. It is also perfect to wear for Thanksgiving since it's loose and forgiving. It's perfect for over indulging during the holidays without worrying about how you look since it's loose and flattering to wear. It runs big and I'm wearing an XS for reference. I paired this outfit with my favorite boots which I've been wearing non-stop because they are so comfortable. I've also wore them in this blog post here. 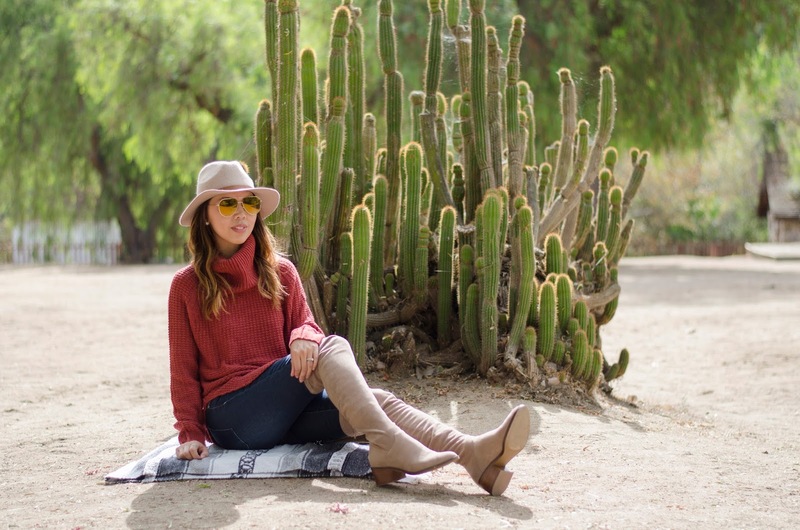 If you are looking for some over the knee neutral boots, these are perfect. They are not too high and I love that they stay up. I actually sized down 1/2 a size and got them in 8 1/2. I'm usually a size 9 in boots. They also come in black and currently on SALE. If you are thinking of about them, make sure to grab them before they sell out. I'm so excited about Thanksgiving and seeing my family. It's also nice to be back home since my husband and I have moved around a lot and had to spend Thanksgiving alone. This is our third year in San Diego and I'm just thankful to be back home and close to my parents. Nothing says Thanksgiving than being close to family and friends. Stay tuned for a blog post on more outfit ideas to wear for turkey day. Thank you for stopping by and I'm so thankful for all of you. I also wanted to share an amazing photographer and friend that I've recently met named Jules. She is such a great photographer and I had the pleasure of shooting with her last weekend. 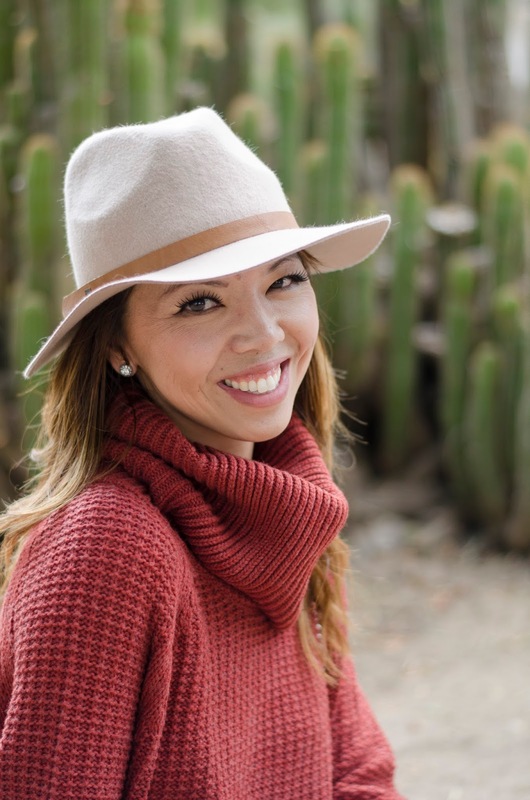 Jules is a portrait photographer and she definitely has that creative eye and she is so sweet and so much fun to work with. If you are in San Diego make sure to check her out. You can find her on Instagram here. I hope you have fabulous weekend! We are heading to LA to celebrate my sister's birthday and I can't wait to spend time with my niece. Simple Addiction. Please DM me to claim your prize! Stay tuned for more giveaways coming soon!